It’s hard to believe that Fabian and I will be celebrating our seventh wedding anniversary this Sunday! Time really flies. Right before getting married, we purchased a Sealy Posturepedic Ultra Plush mattress, which we had until the beginning of May. Late last year, we started talking about getting a new mattress, even though the universal recommendation seems to be to change out your mattress every eight years. After just over six years, our mattress had worn unevenly and was no longer very comfortable. Fabian especially had some sleepless nights on it and I often had lower back pain. Needless to say, we knew we’d be in the market for a new mattress in 2012. About six weeks ago, I received an email from Saatva, introducing me to their line of luxury mattresses and asking if I would be interested in reviewing their product. Since we were in the market for a new mattress, I did some research on Saatva and after familiarizing myself with their high level of craftsmanship, their green initiative (Saatva Mattresses are organic), and learning that their mattresses are made in the United States, I jumped at the opportunity. I was immediately put in contact with the company’s gracious CEO, Ron Rudzin who sent us a king size “Luxury Firm” mattress. Luxury Firm is the company’s Flagship Level of comfort (Extra Firm and Plush Soft are also available). Luxury Firm is described as “the “#1 comfort choice” in the ultra premium mattress classification. This is the standard comfort level used in the finest hotels in the world, where their goal is to ensure every guest gets a great night sleep. “Luxury Firm” offers the perfect balance of “cushion firm and contouring support”. This is achieved by combining our ‘dual coil’ system which features individual pocketed coils that are designed to contour and respond perfectly to any body weight, shape or sleeping position. This assures proper spinal alignment with our premium foam cushion layers for the ultimate and most comfortable sleep experience.” Within one week, the mattress was sent via white glove delivery and we were ready to get a better night’s sleep. It took Fabian a night to really get used to the mattress, but I loved it right away. It really has the ideal amount of support and I haven’t had lower back pain since we received it. After the second night, Fabian was officially converted. We have both enjoyed the ultimate in comfort, resulting in deep, restful sleep. I’ve had to spend a lot of time in bed as I’ve recovered from surgery over the past ten days and I could not be more thankful for my fabulous new mattress. The only hiccup we’ve had along the way was selecting the foundation for the mattress. In addition to offering a 14.5” or 11.5” mattress option, Saatva offers an 8” Standard Foundation or a 4” Low Profile Foundation. I opted for the 8” since our previous bed was already pretty high, but had second thoughts after sleeping on it a couple of nights. Our bed frame is high and combined with a tall mattress, and 8” foundation, our duvet was no longer long enough and my 6’2” husband was having to hop in and out of bed. I called Saatva and they were extremely accommodating, sending me the 4” Low Profile Foundation right away. Everyone that we have dealt with at Saatva has been so pleasant to work with and they’ve bent over backwards for us. We love our mattress and could not be more thrilled with the level of service we’ve received. If you’re in the market for a new mattress, I would highly urge you to consider Saatva. It may seem daunting to purchase a mattress over the internet, but I can honestly say I’ve been getting the best sleep on this bed. 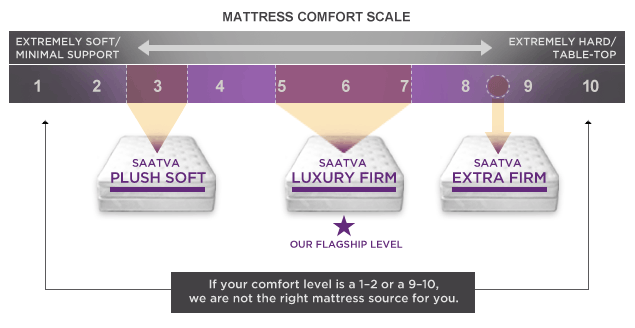 The Saatva website is very informative, allowing you to compare the various Saatva mattresses to those of competitors. Plus, they allow a 30 day in home trial with no restocking fee if you are not satisfied. That’s how confident they are that you will love this extraordinary product. Thank you, Saatva for our fabulous new bed. We love it! Congrats on 7 years, Paloma. Hope you guys had a great time celebrating! Thank you for sharing, Paloma. Headed over. Hope that you are feeling much better. It took a while for me. Looks very comfortable. One should never settle when it comes to the purchasing of beds. Amazing post. I have been in the market for a new mattress and this seems to be exactly what i was looking for. I never knew about this brand. I will be making my purchase shortly! Hey thanks for the post. It was very helpful and came up just at the right time for us as we’re in the process of furnishing our new home. I bought a queen and its the best rest I’ve had in a longtime. Do you still have the bed? Is it still working out for you? Hi, Anonymous! Yes, we still have the bed and my husband and I love it. It’s the best sleep we’ve ever gotten! My significant other and I are also in the market for a new mattress, so I found this review helpful. But I have to ask for transparency purposes: Did the company send you a complimentary mattress set to keep for free? Because receiving something for free could potentially affect how much someone likes a product and how they review it. Thanks for your response! Well, you’re lucky that you got the chance to review the mattress just when you need to replace yours. And looks like the mattress didn’t disappoint you at all! The manufacturers really know what people like you look for in a mattress. And you are absolutely right! If you’re starting to feel uncomfortable with your mattress, then it’s a sign that a replacement is in order! Thanks for sharing. I would love to find a good quality mattress in Ottawa for a reasonable price. thanks a lot for sharing a wonderful article, its very informative and its very helpful..you can really learned a lot from it.. I have been looking for a high quality mattress these past months. I am kinda picky when it comes to mattress. Shopping for the right mattress was never an easy task for me. To help me out, I read a couple of reviews about various mattresses and found Saatva Mattress very interesting. I purchased one and I have proved to myself that the possitive reviews I have read are all true. I bought a Full Size mattress and I am enjoying the comfort it gives me now. Saatva Mattress’ premium quality is purely unique and satisfying! You should give it a try too! I like the contents of this blog. you are really doing it superb. We have bought this kind of mattress and I am really comfortable with it. My husband can really relax from a very tiring day of his work when he go homes. Highly recommended. I notice you did not answer the question as to if you paid for the bed or were given the bed for free to try. Hi, I found your blog via this review while reading up on the Saatva Mattress. Apartment Therapy did a short write up (couldn’t call it a review) and was supposed to do a ‘re-review’ but never did 🙁 Anyhow, I found your review super helpful and I’m totally sold on getting this mattress! My wife and I are totally in the same boat and even bought the same or similar Sealy Posturepedic Ultra Plush mattress when we first got married which has totally sunk in where we lay. It’s been giving us both lower back pain for the last year, but finding /buying a new mattress (the right one) is a pain of it’s own. However, after reading the comments I see I’m not the only one left wondering if you received the mattress for free. Could you please chime in on this question and settle the matter? It’s cool if you did get it for free… however like two other people mentioned, “…receiving something for free could potentially affect how much someone likes a product and how they review it.” Honestly, I think me and your readers would just love to know. After reading your review, I’d say it’s safe to assume that you received it for free, as Saatva contacted you about this ‘opportunity’ to review this. However you never mentioned purchasing anything, so it makes your review sound like a paid or sponsored post. I mean it’s a fantastic review! I’m sure Saatva is happy and it sounds like you are too with new comfortable mattress! But since you haven’t answered the former two questions about it over the span of almost a year, should we assume that got it for free and have nothing more to say about it? C’mon! Hi Anonymous– I received the mattress in exchange for a banner ad on my blog and agreed to do a review if and ONLY IF I actually liked the product. I get asked to review a lot of things and have a lot of things sent my way, but the only ones my readers ever hear about are the ones that I would genuinely recommend without any reservations. A year and a half later, we are still sleeping on our Saatva mattress and continue to love it. If you are considering it, I would urge you to go for it. After all, you can return it, no questions asked without a restocking fee within 30 days if you are not totally happy with it. Happy Thanksgiving and thank you for reading LDV! Hi we are looking for a mattress and happened across this site. what about trying it out before you buy it, wasn’t it hard to put out the money for soemthing you never even sat on? I think it looks great and have went and lay on alot of mattresses and it is amazing how different they all are. what would be the closest in comparison so a person could check it out before they buy? Are you still sleeping on you Saatva? I’m in the market and have been looking at Saatva also. Would be interested to know if you still like it. Thanks! Might give this a try. But since it says luxury mattress. I am having second thoughts already. Is it built for luxury and comfort? Has it held up over time in your opinion? Are you still sleeping on it? Nice review. Is it built for luxury and comfort? Would you recommend it ven after your use for such a while?